A totally retro dessert with cubes of fresh orange juice gelatin seemingly floating in a sea of wobbly vanilla ice cream. Naturally gluten-free! 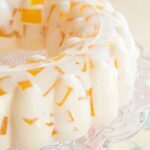 Orange Creamsicle Jello Mold is sure to be a hit at any party or potluck. Gelatin molds are classic vintage recipes, and this is one of the best gluten-free no bake recipes in my recipe box. It’s also one of the gluten free spring recipes I love to make for Easter! With no box mixes here, there’s nothing more fun, pretty, or totally retro than cubes of fresh orange juice gelatin seemingly floating in a sea of wobbly vanilla ice cream. So guys, let’s talk about my mom. She likes stuff. Knick-knacks. Tchotchke. Let’s just say that it’s always an adventure bringing my little dudes to her house because her shelves and tables and pretty much any flat surface is covered with little decorations. Not to the point of crazy hoarded overdone excess. It actually looks really nice, but it’s totally the opposite of my minimalist approach (read: half my crap is still in boxes because there are so many other things I prefer doing than decorating just to have my boys knock stuff over and build Lego towers in and amongst vases and frames and the like). And this is just her normal decor. When a holiday rolls around, the red hearts and cupids or Christmas trees and snowmen or turkeys and autumn leaves or eggs and bunnies come out. And I mean any holiday. The start of a new school year even counts as a holiday. We aren’t even Irish and she still has a box or two of St. Patrick’s Day stuff. Not only does she love putting it all out, but she also loves scouring stores and craft shows for new things. And when she has amassed enough new stuff, she tries to pass on her old stuff (which really is not that old and still in perfect condition) to my sister and me. I’m not making fun. It’s cute, really. And her house always puts people into a happy mood. It’s more than just holiday stuff, though. She likes jewelry stuff and accessory stuff and yes, even kitchen stuff. That’s the kind of stuff that gets me excited. When I’m visiting her and decide to make a recipe for the blog, I can usually rummage around and find some great props to take cute photos, like my No-Bake Nutella Cheesecake Shooters or Lemon Creme Oreo Cheesecake Cupcakes. Plus, without her collection of stuff, this gorgeous piece of art, my Orange Creamsicle Jello Mold, would not have been possible! And seriously, how much fun is this Orange Creamsicle Jello Mold?! I mean – vanilla ice cream jello?! Yes! And scattered through it are bursts of fresh citrus flavor, because there are no box mixes here – this is made from fresh squeezed orange juice. That means that the orange creamsicle gelatin mold is sweet, but not too sweet or fake tasting. And using a good quality vanilla ice cream definitely helps with that non-fake tasting flavor. This was a crowd-pleaser with kids and adults alike! How do you make an Orange Creamsicle Jello Mold? After softening the gelatin in some cold water, dissolve it with sugar in boiling water, then add fresh orange juice. Pour the orange mixture into a pan, let it chill, then cut into little cubes and transfer the cubes to a jello mold. Then repeat the basic steps of blooming the gelatin in cold water and dissolving in boiling water, but this time the cool liquid you add in is melted vanilla ice cream. 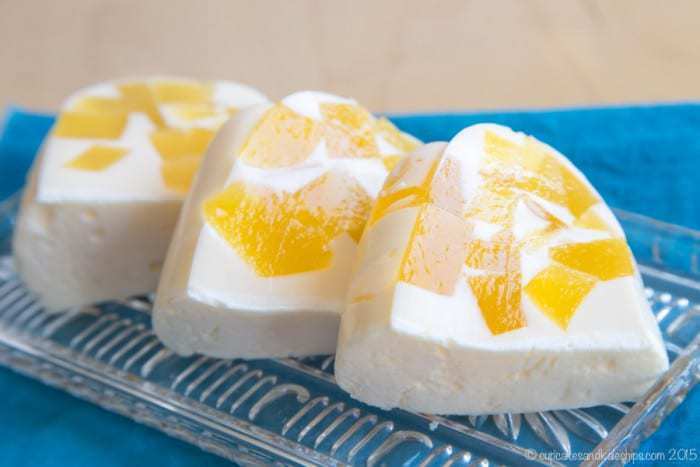 Pour the vanilla ice cream jello mixture over the orange cubes and chill overnight before slicing and serving. 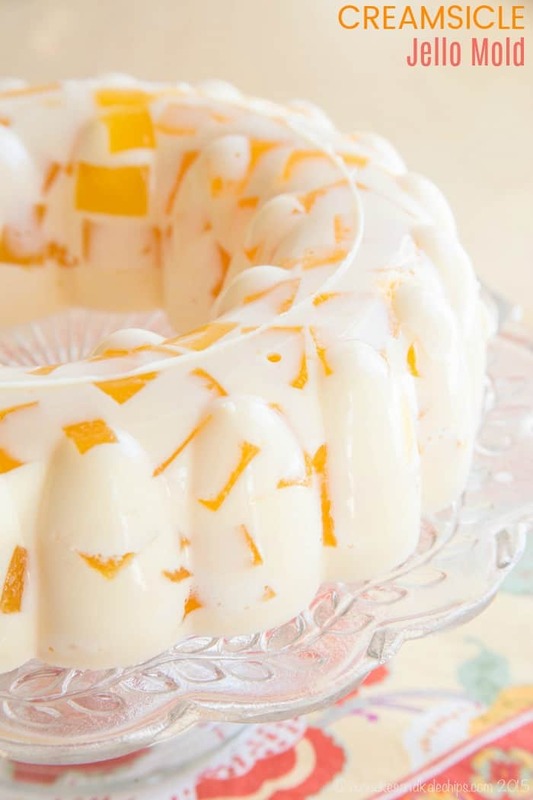 Of course, if you don’t have a mom that saved you her jello mold, you could certainly just use a bowl or rectangular pan to make the Creamsicle Jello mold. Yes, gelatin is naturally gluten-free, so when you use other gluten free ingredients in jello molds and jello salad recipes, you have an impressive no-bake dessert that even those with celiac disease or a wheat allergy can enjoy. Since this Orange Creamsicle Jello Mold only has orange juice, sugar, and ice cream in addition to the gelatin, it’s definitely a yummy gluten free option. And if you like this one, you can also try Rainbow Gel Fruit Parfait Cups or 10 Amazing Jello Recipes to Make You Feel Like a Kid Again. What are some other retro recipes? You can also check out more Totally Rad Retro Desserts, and even some Retro Dinners and Dips. Instead of a jello mold, try these Cherry Jello Jigglers from Living Locurto. 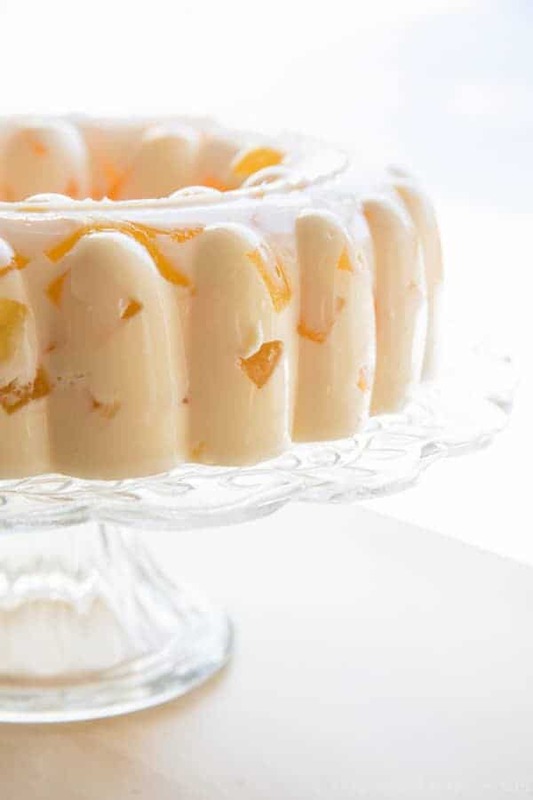 Try the citrus flavor in a different way with Whipped Jello Mandarin Orange Mousse from Amanda’s Cookin. Where can I buy a jello mold? Don’t have your mom’s vintage Tupperware? You can still buy the Tupperware mold I used (you can see it in the video) on Amazon! I love this because it has a lid to keep it covered in the fridge, and the middle part also comes out for easy unmolding. 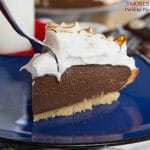 Classic vintage recipes like this one are making a comeback and with good reason! 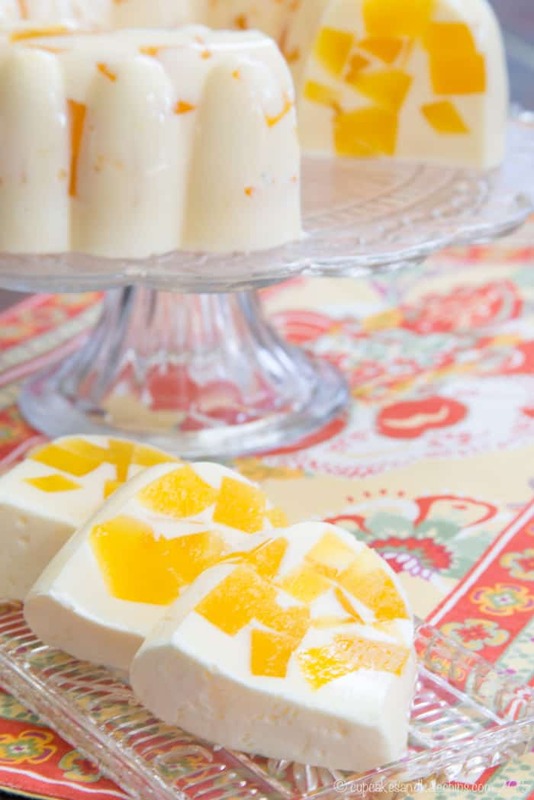 Cubes of fresh orange juice gelatin floating in vanilla ice cream Jello is an irresistibly fun party treat! Sprinkle the 2 packets of gelatin over the cold water. Let sit until absorbed and softened. Pour the boiling water over the gelatin and stir until completely dissolved. Stir in the sugar and orange juice, and stir to dissolve the sugar. Pour into a 9x13 baking dish and refrigerate for at least 4 hours, or until firm. Cut into small cubes and transfer to a jello mold or square baking dish. Store in the refrigerator. Melt the vanilla ice cream in a small saucepan on the stove or in the microwave. Set aside to come to room temperature. Sprinkle 3 packets of gelatin over the cold water. Let sit until absorbed and softened. Add in sugar and stir to dissolve. Stir in the melted ice cream. After ensuring the mixture is at room temperature, pour the ice cream mixture over the orange cubes and refrigerate overnight. Cut into slices or cubes. Adapted from Root Beer Float Jello from Pint Sized Baker. Could you substitute the icecream for sweetened condensed milk since u melt the icecream anyway? Denise, you could try it, but truthfully, I have only made this using ice cream, so I can’t guarantee any kind of successful results if you choose to do that. The melted ice cream provides the sugar and heavy cream that are needed to firm up the gelatin. What a fun summer idea! Great recipe! Cottage cheese is wonderful with Jello! Especially the tangy flavors. It”s great to use on layered Jello with a layer of sour cream and a layer of cool Whip. And a layer of nuts on the top! Can also put a layer of cream cheese if you want. Your ideas for improving the recipe sound delicious, thank you! I’ve mad molds before but never with ice cream. I want to make and take this to a 70’s office party. Do you think it’ll melt faster than regular jello? Hi Kim – A 70’s office party sounds like great fun! Unfortunately, this dessert should be treated like ice cream. If you have a cooler that you can pack with ice, I bet the creamsicle Jello mold will last for a couple of hours. Good luck, and enjoy your party! The jello mold is from Tupperware. We’ve been making it since the 50’s. If you are interested in the jello mold or any other products, please visit my website. I am an authorized Tupperware consultant. It’s great to know that the jello mold is still being manufactured. Thank you! How much in teaspoons is one envelop of gelatin? This is so awesome!! I love that it’s entirely from scratch, too. It really turned out beautifully. I’ll have to see if my mom kept her old jello mold so I can properly make this one sometime! Looks so refreshing and lovely. Thank you. Oooh you just brought back memories of buying dreamsicles from the ice cream man!! This jello mold version is gorgeous!! THIS. IS. AWESOME. I wasn’t expecting ice cream when I opened up your post. Love it! This is one of the most beautiful molds I ever seen! I love orange creamsicle! I think my girls would go nuts over this one! This is calling my name! I’m going to try this soon with a twist. Thanks for the inspiration….. I am not going to lie… I have never made a jello mold before but after seeing this work of art. I am running to the nearest thrift store to find a jello mold! Can you believe I actually found them on Amazon! I love that you did this from scratch! I can’t wait to try it! You have to – it was so fun! Your mom and mine would get on so well. The minimalist in my just doesn’t understand her love for knick-knack but I wouldn’t have her change for the world. 🙂 This looks incredible, I actually haven’t made anything with jello in a long time. Think this looks like a perfect summer treat. Gotta love moms, no matter what! Thanks! No jelly mold…how about a Bundt pan? That should work, just be carful unmolding that it doens’t break, since it probably won’t be completely full. You can use a square pan or a bowl too. I love creamsicles and I love how beautiful this dessert looks. Your orange cubes are nicely suspended! That isn’t always easy to do but yours looks great! What a pretty dessert! I love the artistic look of it all! This is so pretty and I love that it has the creamscicle flavor! Yum! I actually really like creamy jello…things, but I don’t think I’ve had any made with ice cream. Sounds delicious. It is such a creative way to flavor Jello. Think of the possibilities! This is beautiful – and I think I would love the ice-cream part … can’t wait to try it! Thanks for the fun recipe. The ice cream is really cool, and yummy! This looks awesome!! Totally reminds me of something my grandma would make, in the best possible, most yummy way! Now this is an impressive Jello mold!! Yup, truly a work of art! Lucky you with access to all your mom’s treasures!!! Yes, I grew up in the day of jello infiltrating all kinds of recipes and I remember them all so well! I was a huge fan of creamsicle, and my dad loved them also. I’m pretty sure I would enjoy this salad with no problem! I’m still laughing over the jiggly challenge! Your looks so cool. Those chunks floating around is just so much fun. And yes, I totally agree that the mold is what really makes it awesome. That’s what I love about the Sunday Supper themes – gets me to make thing I normally might not think of. Me too! I just think it’s interesting that I can’t find a single kid who doesn’t love creamsicles. And creamsicles “bring out the kid” in all of us, don’t they! I love this unique and fun dessert.